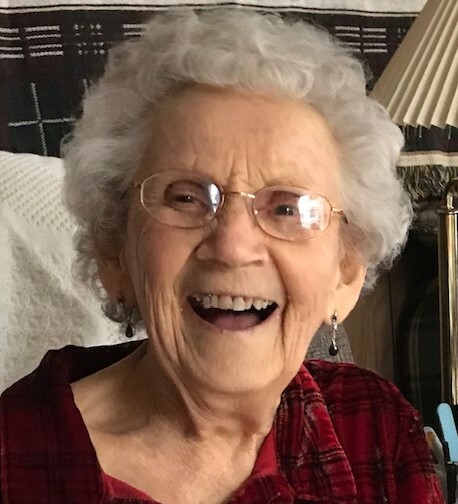 Kathryn Virginia (Painter) Porter Morrison, age 90, of Maysville, WV passed away Sunday, January 27, 2019 at her home. She was born July 30, 1928 in Lahmansville, WV and was a daughter of the late Harman Talmadge Painter and Myrtle Ellen (Jones) Painter. In addition to her parents, Kathryn was preceded in death by her first husband, Marshall Hutton Porter on June 16, 1971 and her second husband, John Hull Morrison Jr. on August 3, 1997 step son, John Hull Morrison III; daughter-in-law, Dianna Ann Porter and one step-granddaughter, Kelly Ryan Morrison. ; two sisters, Shirley White and Lois Via and one brother, Paul Painter; She was the last member of her immediate family. Kathryn was a graduate of Petersburg High School Class of 1947. She was a teller at the Grant County Bank in Petersburg until her retirement. She was a member of the Lahmansville United Methodist Church where she was the pianist for more than sixty years. Kathryn is survived by three children, Larry (Aileen) Porter, Mark (Laurie) Porter and Ellen (Doug) Rexrode and one step-daughter, Susan Morrison; five grandchildren, Suenette (Donnie) Barr, Sonya Rexrode, Marshall Porter, Heather Thorne and Tressy (William) Carrol; one step granddaughter Rebecca Morrison; eight great grandchildren and one great- great grandson; sister-in-law, Eleanor Painter and brother-in-law, Vincent Via and several nieces and nephews. Friends will be received from 4:00 -8:00 PM Tuesday, January 29, 2019 at Schaeffer Funeral Home in Petersburg. Funeral service will begin at 1:00 PM Wednesday, January 30, 2019 at the Lahmansville United Methodist Church with Pastor Beth Jacobson and Rev. Ann Harrison officiating. Burial will be in the Lahmansville Cemetery. The family suggests that memorials may be made to Lahmansville United Methodist Church, 346 Appalachia Ridge, Petersburg, WV 26847 or Hospice Promise Foundation, c/o Grant Memorial Hospice, 100 Hospital Drive, Petersburg, WV 26847 or Charity of donor’s choice.